After finishing Such Fine Boys, I began work on a new novel (see Blog Hop below). But a novel is a long haul and I sometimes break off to write a short story or poem. I now have a book-length collection of stories, which I’m currently editing for publication. Watch this space! Meanwhile, I’ve been entering some of them for the annual Cambridge Writers Short Story Competition. I’ve been a member of this group for five years now and usually I enter just one story. But in 2014, torn between two, I decided, on payment of a small fee, to submit both. So imagine my double surprise when one of them took first prize and the other came highly commended. 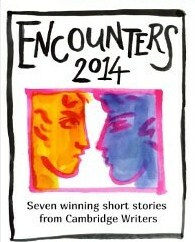 The judge was Jim Kelly, a crime writer from Ely, and the winning stories can be read, together with his Introduction, in Encounters 2014, an e-book available from Amazon. I was also pleased to be a prizewinner in 2016, when the judge was local author Deborah Mehler, and in the 2017 competition, judged by Helen Marshall, who teaches Creative Writing at Anglia Ruskin University. Again, the winning stories can be read in Seven Sins 2016 and in Rituals 2017, also available from Amazon. Alternatively, you can read many of these winning stories, including my own, on Cambridge Writers. Simply click on the link to Members and then on the images of the prizewinners. Where do I go for inspiration? Well, one of my favourite independent bookshops is Gay’s the Word in London. Conveniently situated at 66 Marchmont Street, just a short distance from King’s Cross, it’s a great place to drop in and browse on your way to the British Museum or into town. The staff are always friendly and the range of books is wide, covering every genre of queer literature. But it’s more than a bookshop, of course; for many it’s a community, a refuge and a lifeline. I am grateful, too, for the support I’ve had from Gay Authors Workshop, a London-based association of lesbians and gay men who are poets, dramatists and fiction writers, and delighted that a story of mine has now been published in the latest anthology from this group, A Boxful of Ideas. My thanks to David Franks for inviting me to take part in this Blog Hop. His fiction focuses on relationships, sometimes in historical settings, and his post from last week is here. When not diverted into shorter forms, I press on with my second novel. This began with the idea of reworking Madame Bovary in a contemporary gay setting, though it quickly broke away from its origins and assumed a life of its own. My Emma character is called Evan, and though he shares some characteristics with Flaubert’s creation he’s altogether his own person, to the extent that I don’t know how he’ll develop. This is all to the good from my point of view because I don’t like to know where my fiction will lead me. Hence, like many writers, I’m reluctant to say much about it until I’m ready to publish. To which genre does it belong? I can think of several, but I suppose the most obvious is queer fiction. Of course, queer fiction now divides into subgenres – crime, thriller, romance, historical, etc. – thus adding another layer of complication. However, I tend to write without any thought of genre. My novel Such Fine Boys is a love story, so I suppose it could be filed under ‘romance’, though I think that would give a false view of it. The work of Michael Cunningham, Alan Hollinghurst, Colm Tóibín and Edmund White gives some indication of the kind of fiction to which it aspires, though the voice, I hope, is my own. Structurally, it splits into four parts and moves from first- to third-person narration via several viewpoints. However, its main distinctive feature, I’d say, is its voice. I like the notion of finding an ‘objective correlative’. This rather daunting literary term, popularised and developed by T.S. Eliot in his essay ‘Hamlet and his Problems’, refers to the process by which we invent – or perhaps discover – characters and situations to express – or objectify – our personal experience. Isn’t this why we tell stories? In telling stories we find symbols for our own deepest compulsions; and this is why all writing, in my view, is autobiographical. The characters and events may be wildly remote from us, but we couldn’t write about them if we didn’t feel some deep personal connection. I sit at my computer from eight in the morning until mid-afternoon. If I’m writing fiction, I start at the beginning and progress line by line, often with little idea about what will come next. I polish every paragraph until it attains a satisfactory shape. This means that I never write more than a few hundred words a day, but for me it’s the only way. I’ve tried writing at speed and then shaping a mass of raw material, but I simply can’t rid myself of the itch to polish as I go along. In the end it comes down to hard work. Arnold Bennett, however, was too harsh when he said he’d rather break rocks; I love writing and none of us would do it if we didn’t feel compelled. Even so, terms such as ‘inspiration’ and ‘writer’s block’ bother me. It’s not the terms themselves – they denote states that do exist – but rather the way they are used to mystify the creative process and sometimes to justify laziness. Certainly there’s a mystery to writing, but it shouldn’t become a fetish.